Big thanks to the publisher and author for an advanced reading copy of A Boy and His Dog at the End of the World in exchange for an honest review. Receiving this ARC did not influence my thoughts or opinions on the novel. First eye catching this about this novel is the title and cover. There is very much a Girl With All the Gifts vibe going on with the cover design, WHICH I LOVE, and the storyline has a similar POV of a young child in a post-apocalyptic world. Unlike TGWAtG, ABaHDatEotW doesn’t deal with zombified humans and survival amongst their numbers, but it does deal with surviving what humanity is reduced to after a world-changing event. It is the relationships that are built when all hope is lost, and the trust you have with another to survive. Seeing the world from Griz’s viewpoint is sort of mind-blowing as the everyday items we tend to take for granted are full of excitement and wonder when he stumbles upon them. It is this naivety, along with the companionship he shares with his dog, Jip, that completely enraptured me and kept my heart in this story and with Griz. Connecting with characters in the worlds I explore through reading will always be a deal-sealer when it comes to finishing books. But let’s be honest: I really read this book for the dogs. Having 3 of them myself, I am the Dean Koontz of suckers for books with dogs somehow incorporated in them. And before you get any hesitancy about terrible, horrible, no good, very bad things happening to doggos in the novel, I can put your mind at ease (somewhat) as there are plenty of highs to go with the lows. 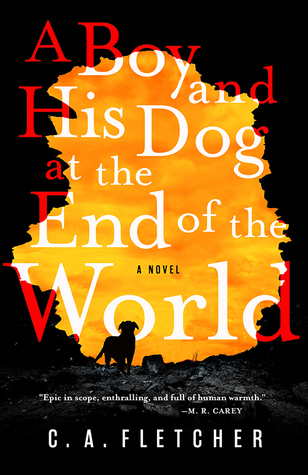 Overall, A Boy and His Dog at the End of the World is a captivating read full of fantastic world-building, enthralling characters, and plenty of heart. It is the post-apocalyptic book of 2019 that you need to have on your TBR and is an adventure that you do not want to miss. Currently reading this and I’m enjoying it. It’s so lonely and beautiful.